Articles in category "Shipping Events"
Yesterday we witnessed the finish of the Tall Ships race in Flushing, an impressive sight. 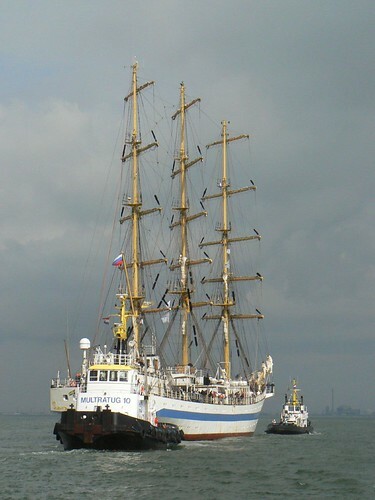 The race was part of a year round event commemorating the 400th anniversary of admiral Michiel Adriaenszoon de Ruyter. Our host, Multraship, had arranged for a small boat to bring its clients as close as possible to the ships which resulted in some nice pictures. More pictures of the day can be found here. Eyefortransport would like to give you one of the first chances to apply for a FREE ticket (worth upto $1595) at either the 9th eyefortransport North American Technology Forum taking place in Chicago on May 30-31, 2007 or the European Technology Forum taking place in Amsterdam on May 22-23, 2007. Plus, as an extra bonus we will also cover your hotel room for one night during the Forum. To see if you qualify for a free ticket at the North American Forum please visit http://www.eyefortransport.com/techforum/attending.shtml, and for the European Forum visit http://www.eyefortransport.com/eutechforum/attending.shtml. At each event there are only 100 free tickets available for senior executives who work for a transport or logistics provider who are actively involved in IT decision-making - and these tickets will all go very quickly, so please act now. If you are a solutions provider to the industry and your customers are transport or logistics providers then please visit either http://www.eyefortransport.com/techforum/sponsoring.shtml for the North American Forum or http://www.eyefortransport.com/eutechforum/sponsoring.shtml for the European Forum for further information on how you can get involved. The program and speaker list for both Forums are currently being developed, and should be finalized by the end of this month. If you are interested in speaking at either event then please contact Chris Saynor at csaynor [at] eyefortransport . com. GC Rieber Shipping will present the newbuilding process from idea, evaluation of profitability, design and model testing until a vessel is ready to be launched from the yard. The BIMCO 39 Knowledge Network is a remarkable opportunity to mix and mingle. This gathering is kindly co-hosted by YoungShip Bergen. The programme includes informative presentations, a light dinner buffet and plenty of time for networking. YoungShip Norway ?EUR" consisting of YoungShip Bergen and YoungShip Oslo - provides a forum for young people who either want to enter, or who have already become involved with the shipping business. It has approximately 160 members under 35, mostly form the Bergen area. Please visit http://www.youngship.weblify.net for more information.